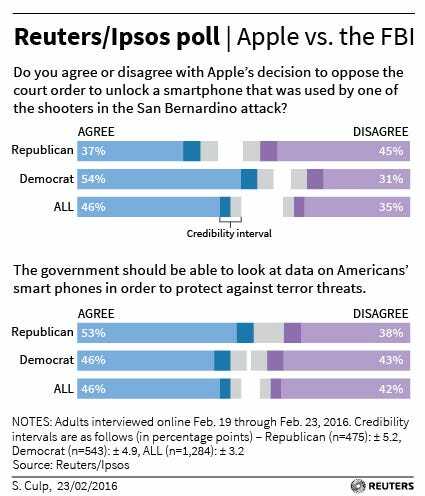 Nearly half of Americans support Apple's decision to oppose a federal court order demanding that it unlock a smartphone used by San Bernardino shooter Rizwan Farook, according to a national online Reuters/Ipsos poll. Forty-six percent of respondents said they agreed with Apple's position, 35 percent said they disagreed and 20 percent said they did not know, according to poll results released on Wednesday. Other questions in the poll showed that a majority of Americans do not want the government to have access to their phone and Internet communications, even if it is done in the name of stopping terror attacks. The responses to the privacy questions in the poll are similar to results from a 2013 Reuters/Ipsos poll, showing a consistent desire on the part of Americans to keep their phone, Internet communications and other data private. Most of those polled also feel that unlocking Farook's phone would set a dangerous precedent that authorities would use to force the company to unlock more phones, a claim that Apple Chief Executive Tim Cook made in an open letter to customers last week. When asked if the government would use the ability to unlock phones to "spy on iPhone users," 55 percent said they agreed, 28 percent disagreed and the rest said they were not sure. “I don’t believe in giving up our right to privacy in order to make people feel safer,” said Steve Clanger, a 55-year-old real-estate appraiser from Wheelersburg, Ohio, who took part in the poll and is supporting Apple. “The government overstepped its bounds with the Patriot Act and they are likely to do it again,” he said, referring to a 2001 law that eased federal investigators' access to people's communications and financial records. The government has said Apple must help because there is no way to get at the data on Farook's phone without the company engineering a special software solution. Apple executives have refused, saying it is an onerous request that puts the security of its customers at risk. 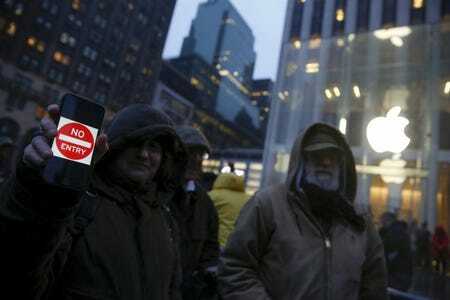 Mike Kostrzewa, a 69-year-old retiree from Fairfax, Virginia, said he believed Apple should comply with the court order. “If a person has nothing to hide, there is no reason they should be afraid of the government looking at specific content with a warrant,” said Kostrzewa, one of the poll's respondents. Younger Americans are more likely than older Americans to agree with Apple's stand. Of those between 18 and 39 years old, 64 percent agreed with the company's decision to oppose the court order. That is nearly twice the percentage of older people who are supporting Apple. The poll results reflect a deep sense of skepticism among Americans about the security of their information, said Ipsos pollster Chris Jackson. Privacy concerns have grown in response to revelations about U.S. government surveillance programs as well as a constant stream of high-profile security breaches that compromised consumer records including credit cards numbers, email logins and medical information, he said. "People are very distrusting of everybody, but Americans actually trust Apple a bit more than the government on some issues," Jackson said. The Reuters/Ipsos poll shows that large numbers of Americans want to keep their phone records, text messages, emails and other Internet activity private. For example in this month's poll, 69 percent said they would not give up email privacy even if it would help the government foil foreign terror plots and 75 percent said they would be unwilling to give up text-message privacy for the same reason. Opinion on whether Apple is right is divided by political party lines: 54 percent of Democrats agree with Apple, while only 37 percent of Republicans support the company. Donald Trump, front-runner for the Republican presidential nomination, last week said he would boycott the company's products until it unlocks the phone. Democratic U.S. Representative Ted Lieu on Tuesday asked the Federal Bureau of Investigation to rescind the unlock order. "There is this tension: Americans want terrorists to be prosecuted, but in the context of issues about security and privacy, it becomes a much more nuanced discussion," Jackson said. On Monday, Pew Research Center said its polling found that 51 percent of Americans believe Apple should unlock the phone and just 38 percent support the company's refusal. The Pew question provided less information about Apple’s concerns and mentioned that the FBI’s need is “an important part” of their investigation. The Reuters/Ipsos poll question on the same issue stated the company's position, which is that complying with the request would set a precedent that would require it to provide similar assistance in future cases. The online survey was conducted Feb. 19 to 23 with more than 1,500 U.S. adults, as Apple and the government made public statements to sway public opinion in the high-stakes case. It has a credibility interval of plus or minus 2.8 percentage points for all respondents. FBI spokesman Christopher Allen declined comment on the poll results. Apple did not respond to requests for comment.